1. It gives customers an unexpected surprise. Shopping can be full of surprises – from the items found in store to the great, unexpected sales. The process can be a real pleasure, but when a store goes a step further to enhance the retail experience for the customer, the shopping trip can become even better. Customers will always appreciate their in-store experience going beyond their exceptions. Look at this fun video for a North Face Korea store. As shoppers are selecting coats in store, the floor underneath them begins to move, forcing them to climb a rock wall before falling inside…talk about shopping ‘til you drop! 2. It keeps customers engaged and immersed. Part of any shopping experience is not only seeing, but also touching. Walk into any clothing store and you’ll see sales associate carefully folding back shirts someone has just finished rummaging through. It’s no secret that shoppers love interacting with products and in-store features, whether they are tangible or ones on a touchscreen. Pulling a customer into your retail environment and keeping them there is what leads to sales. 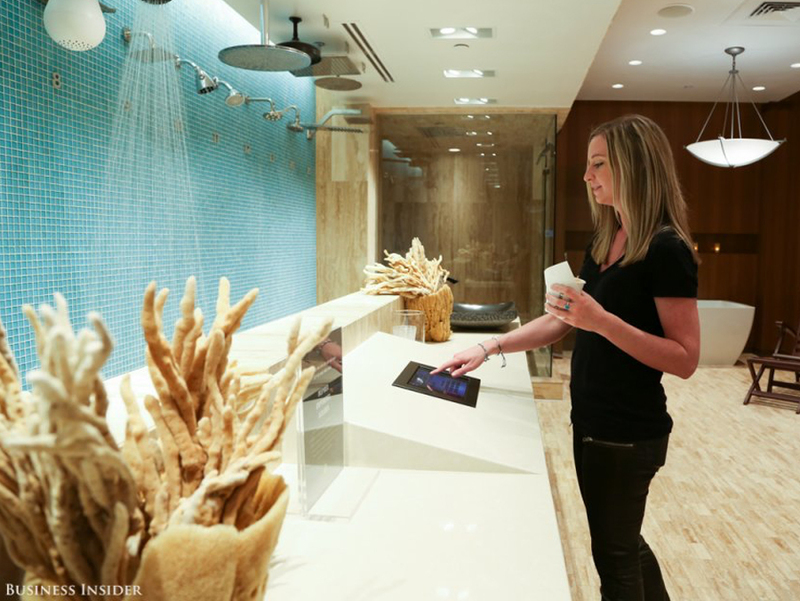 Pirch, a home appliance store, has made the shopping process for items such as sinks and ovens so pleasant through interactive in-store experiences that customers spend an average of two hours inside the store. For instance, customers can test different shower heads by turning them on simply through touch of a tablet screen. 3. It provides information, educated the customer, and gives them a way to make a more informed purchase decision. Many purchase decisions are made on impulse. And because the customer had no plans of purchasing the product before walking into the store and has no prior research of it, he or she wants to know as much about a product as possible when they are deciding whether to buy it. Interactive displays and surfaces can help with the process, making it both informative and entertaining for the shopper to help their decision easier and guide them towards purchasing the product. Van Heusen is a great example. The brand merged tech with style by revamping their Bangalore, India store to include areas which measure your body, suggest the best outfits, and show you how you would look in those outfits, all virtually! The fun and informative shopping experience gives the customers everything they need right at their fingertips so that the decision and purchasing process is easy as can be. 4. It gets them talking…and sharing. Let’s face it, people love to share! If something as small as a beautiful plate of pasta can spur an Instagram post, there is no doubt that an interactive feature in a store will also. People whip out their phones at the first sight of something cool, new or different, ready to share it with the world through social media at a moment’s notice. Creating an interactive environment will surely get people talking, snapping, and hash-tagging…it’s free promo all in your favor! 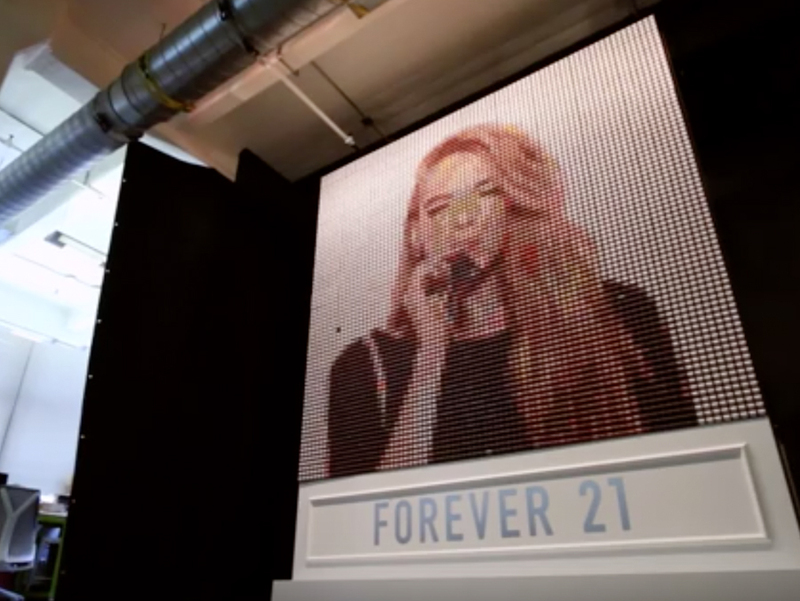 The Forever 21 Thread Screen, for instance, used 6,400 spools of thread to turn selfies into art. Showing how well Forever 21 understands their customers and their lifestyle habits, Instagrammers who used the #F21ThreadScreen hashtag could see their images transformed on the screen in real time, connecting fashion with technology. Your photo re-created in thread on a giant screen…who wouldn’t want to share that? 5. It keeps them coming back for more. Memorable and magical experiences create loyal customers. When a person knows a brand can deliver through not only the products they sell but the experience they create, the customer will remember it and return, becoming a loyal patron…and they may even bring back a few of their friends to share in the experience. Take a look at this interactive concept table from Pizza Hut that totally changes the dine-in ordering experience by letting customers customize their orders through a touchscreen table and play game while they wait for their pizza to come out of the oven. Getting pizza is already a treat on its own, but this type of technology and interactivity takes it to a whole new level! 6. It make your brand stand out. The more your brand can stand out the better. People appreciate any retailer that can go outside the box and get them excited. Paul Smith, for example, really caught the eye of window shoppers. The London store brought its suits to life through an interactive holographic right in the window display. Interactive retail solutions bring advantages to both the business and the customer. 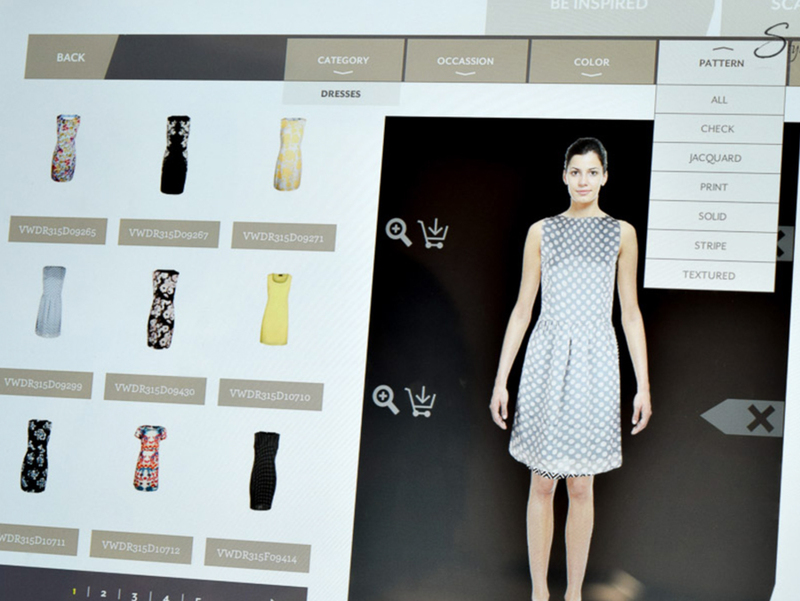 Businesses can implement interactive store features to not only thrill their shoppers, but to get valuable insights into their buying habits and behaviors through collected data and analytics. Customers, on the other hand, get a one-of-a-kind shopping experience that’s fun, easy, and informative, giving them a reason to return.